In this article you will find out what you need to know (and some things you don’t) to make an informed choice when choosing what type of dimmer you need for each application. Dimmers work by simply reducing the voltage supplied to the lamp, which results in a light output decrease of the light bulb. This has many advantages in addition to being able to set the light levels to suit your mood. The simple act of using a dimmer results in a reduction in consumption and saves you money. It increases lamp life so lamps need to be replaced less frequently, which results in reduced replacement lamp and maintenance costs. There are many types of light bulbs and capsule lamps that can be dimmed but the requirements for each type can vary. If you select the wrong type of dimmer it may not work, could lead to reduced lamp life or even blow the dimmer or light fitting in extreme circumstances. Leading edge dimmers are compatible with resistive or inductive loads and are able to reduce the load by shortening the A/C cycle at the leading edge of the input waveform, hence the term ‘Leading Edge’. The best of these are marketed as ‘intelligent dimmers’ and feature soft-start and overload protection to improve the life span of both the lamps and the dimmer. If you mistakenly connect too many lights or transformers to an an intelligent dimmer it will protect itself from failure by turning the lights down or off until the load is corrected. Leading edge dimmers are the most commonly used to dim incandescent and mains voltage halogen light bulbs and capsules. They are also used to dim most electronic low voltage transformers, including wire-wound or toroidal transformers and can also be used to dim constant current dimmable LED drivers under certain circumstances that will be explained later. All dimmers are rated by wattage and leading edge dimmers are no exception. They are commonly available in 250w, 400w, 600w and 1000w modules. It is important to note that they also have a minimum load requirement of 25w, 40w, 100w and 150w respectively. These wattages must always be adhered to and in the case of halogen lamps and capsules must be over-rated by at least 25%. GU10, G9 and GZ10 halogen lamps and capsules tend to arc in the latter part of their life. This is not dangerous in any way and is a characteristic of halogen lamps. This arcing creates an additional load on the dimmer and can overload the module resulting in excess heat and premature failure. The first indication of this happening is an increase in noise, often heard as a buzz from the dimmer switch. It is important to note that all quality branded halogen capsules incorporate a fused link to protect the circuit in case of a short within the lamp. Non-branded cheap generic halogen lamps do not have this function and should be avoided. Never use a dimmer module that is not rated higher than the total load applied to it. Trailing edge dimmers are compatible with resistive or capacitive loads and are able reduce the load by shortening the A/C cycle at the trailing edge of the input waveform, hence the term ‘Trailing Edge’. The best of these are marketed as ‘intelligent dimmers’ and feature soft-start and overload protection to improve the life span of both the lamps and the dimmer. If you mistakenly connect too many lights or transformers to an an intelligent dimmer it will protect itself from failure by turning the lights down or off until the load is corrected. Trailing edge dimmers are far more complicated than their leading edge counterpart and are more expensive to produce and purchase. They incorporate many features such as soft start; smooth control, silent running and multi-way dimming that greatly enhance the life of the lamps and fittings. They are commonly used to dim most electronic low voltage transformers (ELV) with capacitive loads on the primary circuit. Trailing edge dimmers can also be used to dim incandescent, halogen and LED lamps effectively. They should not be used on older type of magnetic core and coil wire-wound or toroidal transformers. Although a trailing edge dimmer is considerably more expensive to buy, it has many desirable attributes over its leading edge counterpart and in certain situations may be more appropriate. Inductive dimmers are designed to be placed on the secondary side of a low voltage or LED lighting scheme. They are rated in VA (Volt Amps) rather than watts and have already been over rated to deal with the rush of current from the transformers. It would be unusual to find an inductive dimmer in the normal domestic setting. Dimming fluorescent fittings is complex and can involve analogue or digital dimmers and a variety of different wiring schemes. These are expensive to install and are mainly used for commercial applications and are beyond the scope of this article. That said, some domestic fluorescent fittings are becoming available that are dimmable. These are dimmed using an analogue type dimmer. The fitting incorporates variable voltage high frequency control gear or regulated ballast that is typically rated at 1 – 10v. These can be dimmed between 3% and 100% illumination by using a suitably rated dimmer but must incorporate a separate on/off switch. With the phasing out of incandescent lamps, more and more fluorescent lamp manufacturers are making dimmable lamps available. They are at an advanced stage of development and although expensive at this time, it is anticipated that the price will reduce as they become more popular. Non-dimmable LED lamps and light fittings cannot be dimmed. Should you fit a dimmer to non-dimmable LED’s then damage to the dimmer, lamps or both will occur. Mains voltage dimmable LED light bulbs and LED light fittings can be dimmed using an ordinary resistive dimmer. LED lamps are an attractive proposition as they consume very low wattages and are very energy efficient. This can cause problems when choosing the correct dimmer. Under normal circumstances, so long as the minimum load is exceeded, dimming mains voltage LED lamps is not an issue so long as the minimum load is observed. This British made Varilight V-Pro programmable dimmer is our default choice when dimming LED’s. Dimming low voltage LED lamps is also easily achieved by either dimming the driver on the primary (mains) side or on the secondary (low voltage) side. Of the two, primary side dimming is the more desirable and the easiest to achieve. The LED driver would need to be of a constant current type and dimmable. When selecting a transformer or low voltage light fitting it is not immediately obvious as to which type of dimmer is required. In addition, most dimmers purchased on the high street will not tell you if it is leading or trailing edge. The only way to be absolutely certain is to enquire or purchase them through a lighting or electrical specialist. Dimming most domestic light fittings is relatively simple but you must ensure that you select the correct dimming module for the task. 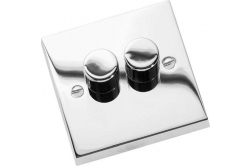 We supply all available types of dimmers in every finish available to match your existing switches and sockets. Due to the large variety and different applications of dimmers we do not offer them for sale online. This ensures that you do not accidentally select the wrong dimmer for your application as this can cause expensive and irreversible damage to transformers or the dimmer itself. Should you wish to purchase a dimmer together with your light fitting we are more than happy to advise you and assist in its selection to ensure that you get it right first time. Please use the contact us tab at the top of this page or telephone 0151-650-2138 for further information on selecting the right dimmer.